Oley Duane Olson Receives Award in 2012, but is now missed by all. DUANE "OLEY" OLSON to the band's history, heritage and tradition. PRESENTED July 2012 - and now today, we all miss Oley! T.H. 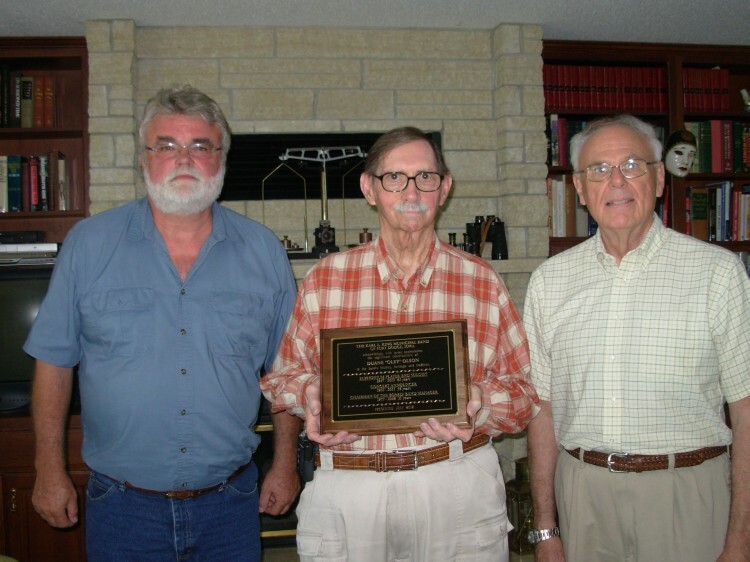 Hoefing and Jerrold Jimmerson presented an award plaque to Oley Olson commemorating his long participation in the Karl King Band and his lifetime of dedication to extending the legacy of Karl King. The Band and the entire community of followers of the Karl King Band extended congratulations to both Oley and Nancy Olson. privately, publicly, and on the Iowa Bandmasters Website. Duane “Oley” Olson, 80, Twin Lakes, died on Tuesday, January 1, 2013. 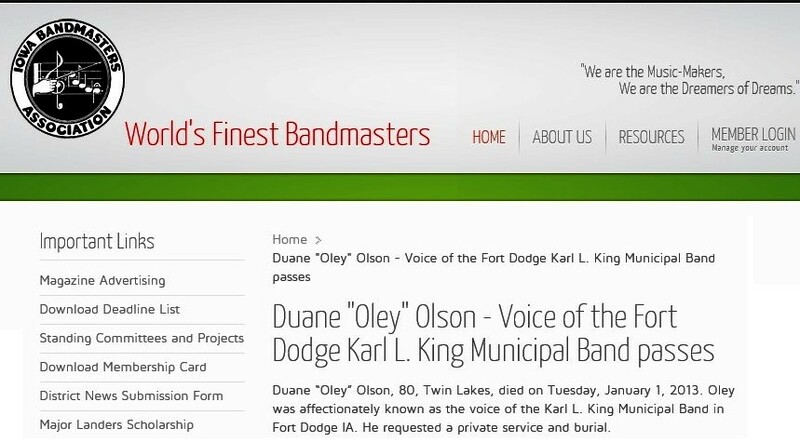 Oley was affectionately known as the voice of the Karl L. King Municipal Band in Fort Dodge IA. He requested a private service and burial. Oley is survived by his wife, Nancy; a daughter, Susan Garro; four grandchildren, Ben, Brody, Bert, and Beth; his brother, Loran; and several nieces and nephews. His parents and two brothers, Dean and Lamont, preceded him in death. Oley was born and raised in Fort Dodge. His earliest memories were of his family attending the weekly band concerts at the City Square and at the Oleson Park Band Shell to hear the Fort Dodge Municipal Band under the direction of Karl L. King. He began playing trombone when he entered junior high school and played throughout high school. When he was 15, he was invited to join the Fort Dodge Municipal Band. Following 18 months playing in Army bands in Korea during the war, he returned to Iowa, rejoining the Municipal Band and attending Buena Vista College in Storm Lake, where he majored in music. After teaching in the Pomeroy schools, he joined Mid-Bell Music in Storm Lake, and became a familiar figure to band directors in northwest Iowa, calling on them weekly at school. He was always willing to visit with anyone when asked about Karl King, whether it was a group of students, band directors, or as an announcer to an audience at a concert. For 65 years, from 1947-2012, Oley played with the King Band, mostly on the Euphonium. He served as the band’s announcer for 56 years, from 1955-2011. He was chairman of the Band board and band manager for 31 years, from 1977-2008. Oley retired from the King Band at the start of the 2012 summer season. The band presented him with a plaque last July, commemorating his significant contributions to the Band’s history and traditions, and his dedication to promoting the legacy of Karl King. Significant accomplishments during his tenure with the King Band included the first commercially available recordings of the Band; the publication of the book “Hawkeye Glory”, which was written by former band member Tom Hatton, and told the history of the Fort Dodge bands; the development of the band’s website; and the construction of the Karl King statue in Fort Dodge. Oley was also instrumental in organizing the concert in 1991 to mark the 100th anniversary of Karl King’s birth; the band’s appearance for two weeks at the Smithsonian Folk Life Festival in Washington D.C. in 1996; and organizing the King Band’s appearances at several state conventions, three national music conventions, and four appearances at Iowa Bandmasters Association Conferences. May all of us be as fortunate as Oley in this life!